Will Packard Bell's smallest netbook offer big performance? The dot s is Packard Bell's 10.1-inch netbook. 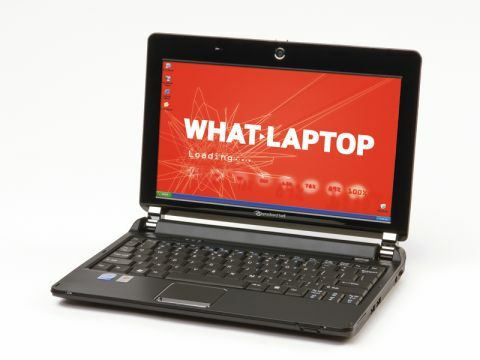 Unlike its larger brothers, the dot m and dot m/a, it stays safely in known netbook territory by featuring an Intel Atom processor and running Microsoft's Windows XP operating system. As with the dot m, the sample we reviewed was a pre-production unit so we were not able to provide full benchmarking results, such as battery life testing. The 10.1-inch screen is very bright and clear. Our unit featured a sharp 1280 x 800-pixel resolution which proved extremely detailed, and office applications and multimedia content both looked great. A glossy Super-TFT screen coating is in place, improving colour and contrast but making this a very reflective panel. The chassis is built from hard black plastic, with a mottled design on the palmrest, and provides great protection when working on the move. The shiny finish to the lid quickly picks up a lot of scratches, dust and grime however. The hard chassis provides a firm mount for the keyboard, which sticks to the more traditional design of tapered-edge keys. As a result, the typing action is the best in the Packard Bell range and we were quickly typing at full speed. The touchpad proved a different story. It is extremely sensitive and almost glitchy during use – we can only hope that this is a problem that will be rectified on the final production build. A 160GB hard drive provides plenty of storage space for all your work applications and documents and also your music, film and photo libraries to keep you entertained when out and about. Portability is excellent. Even though we couldn't test the battery life, our unit being a pre-production model, the 1.1kg chassis weight makes this netbook one of the lightest 10.1-inch machines around. The 802.11g wireless that's included will provide you with a fast connection to the internet at home or when in range of Wi-Fi hotspots, and the 10/100 Ethernet is also sufficient for wired networks. Three USB ports are available for attaching various peripherals such as a travel mouse. A 5-in-1 memory card reader and a VGA-out port - for hooking the netbook up to an external monitor - complete the specifications. While the Packard Bell dot s doesn't really bring anything new to the netbook market, it is a well-rounded machine that should be on most people's list of machines to check out before making a purchase. As long as the touchpad issues are rectified, we are big fans.